Oshkosh - You Gotta Go! Oshkosh is an obvious place to find airplanes of all sorts. "They make overalls, don't they?" If you like airplanes at all -- you know that we're talking about the biggest fly-in in the world. 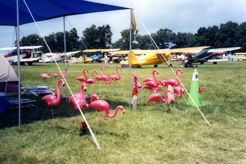 If you don't like airplanes, it would be best to stay away during the last week of July when the EAA has their annual Air Venture. ...it lives up to its name. 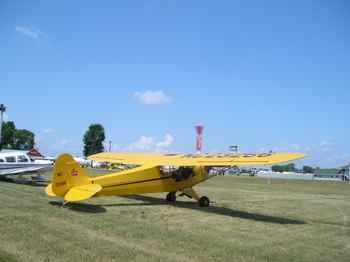 "There's really no place in the world like the Experimental Aircraft Association's annual convention, EAA AirVenture..."
We took "our" newly restored 1939 Piper J-3 Cub from California to AirVenture 2009 in July. Our friends all followed along, so we wrote pages about our journey. Read how we took the Cub for an "AirVenture". And look for the pages that follow it as we took it on a seven day cross country. Having said that they could give you better information, we'll give you advice anyway. So let's give you some future dates! We're planning to go this year... From what we've read, it's going to be a BIG year for WWII planes and jets. Why dates so far out? There are many people who attend year after year, so the limited number of hotel rooms are often booked a year in advance. Here's a direct link to their Where to Stay Page. Notice that their link to hotels and motels says "thousands of rooms still available OUTSIDE Oshkosh." If you're new to this, let's just advise you not to expect to get a hotel IN Oshkosh. It could happen, but... If you're deciding to go only a few months before, you'll be lucky to get a hotel in the next town. Don't get discouraged... and don't stay home! Their site will aid you in finding accommodations either in hotels, dorm rooms or private houses. We've gotten hotels at the last minute only 20-30 minutes away... you can too... just TRY! If you decide you really need to fly into Oshkosh, beware that some PLANES are parked in the next town, but you can camp under the wing of your plane if you want to. There are great shower and restroom facilities all over. And there is a store that opens in the main campground just for the air show. Some exhibiting pilots return year after year, set up camp next to their plane, and have fun! There are going to be hundreds of thousands of airplane enthusiasts, so be prepared for the crowds and lines. The crowds are polite, and everyone loves planes, so just get in line and strike up a conversation. The EAA is very organized getting cars in and out of the parking lots, but it still takes patience. There are plenty of places where you can buy food and drinks. There will be long lines right at lunchtime. Water is available free at water stations all around the airfield. They will remind you often to drink plenty of water... good advice to remember. Bring and WEAR plenty of sun screen. Be prepared for a hot and sultry mid-west summer day or for a possible thunder shower. If you forget any of these, there are shops where you can buy them. Use The Shuttles... And Wear Comfortable Shoes! It's a HUGE air show. There are free shuttles to take you to key areas of the field, but you will still end up walking miles and miles. Please Take Care of the Planes!! Then there are some obvious things.... take care with the aircraft. You're not kept away from most of them. Ask before you touch any of them. Don't let your camera or your sunglasses bump it when you lean in for a closer look. Don't smoke or eat on the flight line or near the airplanes. We've had fun gathering with friends in Oshkosh. We've stayed in motels miles away... and with friends in the campgound. 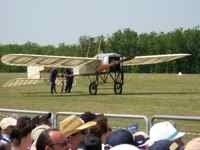 If you like antique airplanes, include EAA AirVenture on your list and start your visit by concentrating on the lines of visiting antiques. Visit their museum. Take a flight in their 1929 Ford Tri-Motor and maybe others. It's all fun. You can visit their museum at other times of the year too... and maybe have a chance to fly in planes that don't fly during the air show. 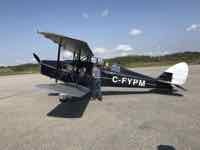 Have your say about this page on Antique Airplanes... what you just read or something you'd like to add! Leave me a comment in the box below.